When Amy Barickman sent me a copy of her new Stitched Style book, of course I immediately opened it and flipped through the pages while Belle and I walked back up to the house. Beautiful! It’s full of pretty embroidery motifs and simple projects, all sort of “boho” style, which I love. And there are SO MANY designs! 65 unique motifs, with over 100 designs to trace or transfer, ranging from tiny blossoms and leaves to big paisleys and borders, including some lovely applique and reverse applique designs. “Hmm…,” I thought to myself. “I wonder if I could digitize some of these and sew them on my embroidery machine?” And I set the book aside to let that idea percolate a while. 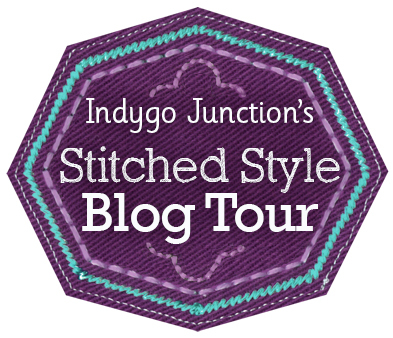 Flash forward a week or so, when Betsy Brockett from Indygo Junction contacted WeAllSew about taking part in the Stitched Style Blog Tour. And, get this… she told us that OESD has digitized several of the embroidery designs to stitch by machine in their SoHo Bandana collection! No need to digitize them myself – while I do love BERNINA’s Embroidery Software, it’s always nice to have someone else do the work for you. Now I just needed to decide what to make for the tour! First, a little more about the book. Have you ever noticed that bandanas aren’t all the same; designs vary from simple to complex, scattered mini-elements to intricate paislies. Well, Amy’s huge collection of bandanas provided inspiration for her SoHo Bandana fabric collection (just one of her 13 collections with Red Rooster), which in turn sparked the idea for the designs in her Stitched Style book. Amy is the founder and owner of Indygo Junction and Amy Barickman LLC, as well as a leader in the needle and sewing arts industry. She has PUBLISHED almost 1000 sewing patterns and published over 80 books including one of my favorites – Amy Barickman’s Vintage Notions: An Inspirational Guide to Needlework, Cooking, Sewing, Fashion and Fun – a must for anyone who collects sewing notions and for vintage domestic arts aficionados. Catch up with Amy at IndygoJunction.com and AmyBarickman.com. Banded Baskets in Three Sizes – These would be great in a sewing room or office. 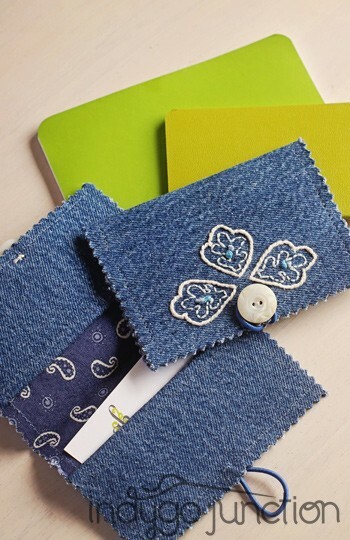 Ocean Denim Case – Perfect for business cards or credit cards. Pasadena Denim Jacket – Subtle in off-white, this would be fabulous in bright jewel tones, too. To see all of the designs in Stitched Style, click HERE for a video tour. I adore the reverse applique designs, with contrasting Crossroads Denim peeking through. 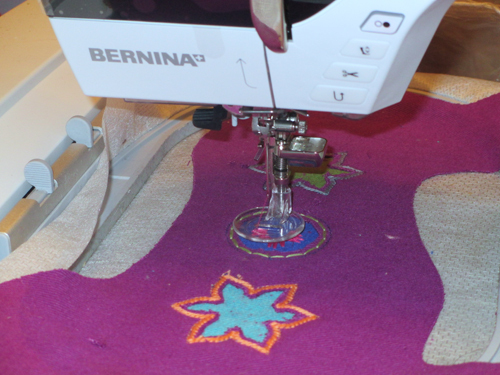 For smooth stitching with no chance of catching the stitches or cut fabric edges, I used the extra-wide BERNINA Cutwork and Echo-Quilting Foot #44C. 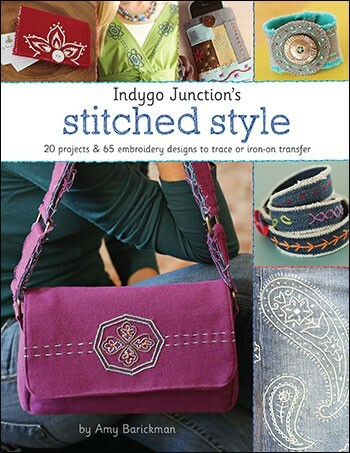 Would you like a copy of Indygo Junction’s Stitched Style for your very own? Leave a comment below to win a copy (note – we can only ship to US addresses); we’ll pick a winner Thursday Friday, January 24, at 11:59 pm, Central time. Or purchase one at 20% off using code SSBT14 at checkout. 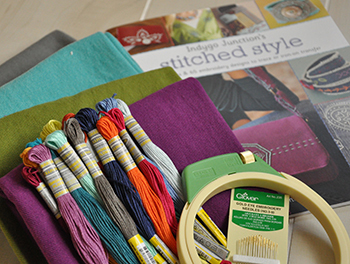 A third option for one lucky winner is this awesome grand prize gift package from Indygo Junction: a copy of Stitched Style, one yard of every color of Crossroads Denim (just think of all the things you could make with 8 yards of denim! ), Sullivan’s embroidery floss, a Clover embroidery hoop, a set of Clover needles, and a HUGE pack of embroidery patterns and books from Indygo Junction! Don’t miss this contest on Thursday, January 24 at blog.IndygoJunction.com. 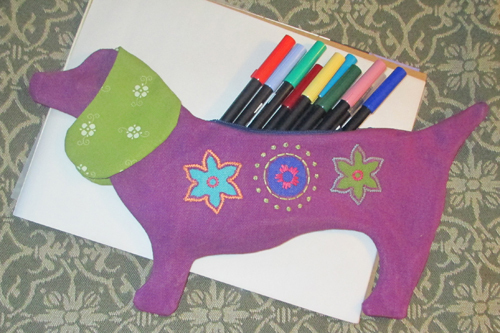 Cutest pencil case ever… I already have so many pencil cases I’ve lost count, but I might very well need this one too. I would love to win! This looks like a good book! Your pouch is so cute! I haven’t tried reverse appliqué yet, but it is something I want to try. Thank you for the review and for the chance to win a copy of Amy’s book. I have some of her SoHo Bandana fabric and would love to make some of the projects in her book. I’d be honored to win this giveaway!!! I’ve been cutting up old denim aprons — would absolutely love some fresh denim in these beautiful colors! Just love hand and machine embroidery!! Thank you for a wonderful giveaway!! Hmmm, another chance to be a Hippie Chik! Love the patterns. Pinned Jessica’s pattern and your pattern and will do my own version, so thanks. I have a friend with 2 mini Dachshunds and she would love this. I would also love to win a copy of Amy’s book. Thanks again and fingers crossed! I love the dachshund pouch! My niece has a dachshund and I know she would love to learn how to make one for herself. Darling ideas! I’d love to win this. All of the projects I have seen so far are so cute! great inspiration — hope I win a copy! What a delightful book Amy ! Your designs and projects are wonderful. Why does this post keep coming up every time a new post is posted? Love the dachshund pooch! Thanks for the chance. I will by the machine embroidery designs, love them too. Love your take on the dachshund case. I also adore the reverse applique designs in the book. I look forward to being more creative with the patterns in the book, and I especially love the embroidery on the denim jacket..super cute.. I love the dachshund case. i would love to win this book. I machine embroider and would love to make some quilts for my granddaughters using some of these designs. That pencil case would be so fun to make with my daughter! Thanks for the chance to win! I love all the craftiness in this book! Thanks for the chance to win. Reverse applique is on my long list of techniques I still want to learn. I enjoyed reading the post. The photos make me want to collect up some of my denim to make something. What a nifty pencil case. Amy Barickman’s designs are inspirational. What a talented lady. This is the only post I can see on my ipad. Please fix the problem. I can’t wait to get my hands on a copy of the book. Would love to win it, but if not, I hope my local shop will have it. The colored denim is awesome. I am definitely looking for that. Oh my! The pencil case is precious but I have big plans for an old denim jacket! Now is the time for updated embellishment! I love this look!!! 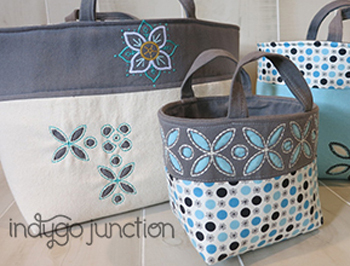 Love Indygo junction patterns, never new there were so many denim colors, Love Love it! The great thing about the projects is that they look quick and easy to do, but still impressive. I saw the Crossroads Denims at the International Quilt Festival. I love them! Those banded totes would come in really handy. Thanks for the giveaway. That pencil case would be a great project with my soon to be seven year old daughter! Thanks! Love this book! and for the pencil tote idea! Thanks for the give away offer, too!! 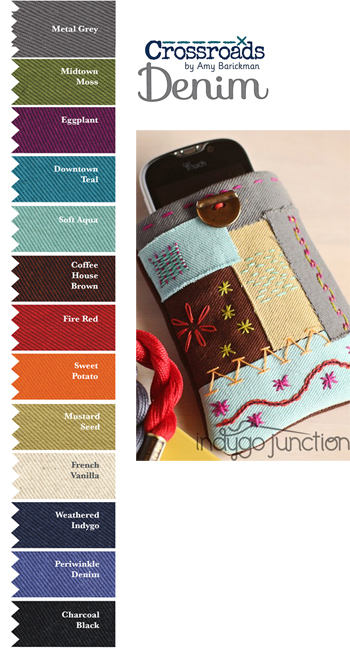 The combination of interesting projects and cool embroidery designs makes this a book I’d like to own … or win! 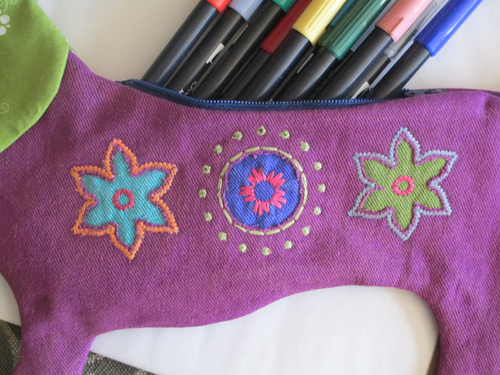 Wonderful projects combining embroidery.Thanks for sharing! 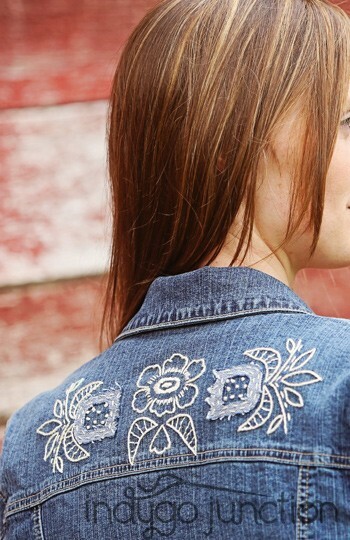 I love the embroidery on the jacket! So pretty, what a great idea! I would love to win this, I just started doing embroidery and love it. Love the great denim colors! Lots of fun ideas. This looks like fun. Would love to win this! It says I’ve already posted, but I can’t find my post – so…I can’t wait to see the new book. Thank you! Oh my gosh ~ that’s the cutest pencil case I’ve seen in a long time and the book looks wonderful! I’d love to be considered for the book, thanks so much! I love the thought of denim in luscious colors. Planning on buying very soon.